The posted movement has the two trains one behind the other and full details are given of every aspect of the construction. The wheelcutting includes the cutting of a crown wheel. The lathe used was the Myford ML 7 lathe.. 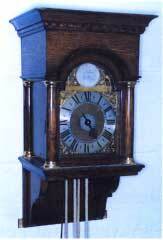 This together with a 3/8" capacity drilling machine were the only machine tools used in the construction of this clock. The movement is fitted with a hanging ring and spurs and can be mounted on the wall or it can be cased as shown. The construction of the wood case is not described in the manual. There are 74 pages and over 160 illustrations.